Have you ever tried Chutney with pumpkin? If your answer is no, then I would strongly recommend you to try this chutney. It tastes awesome. It can be had with pain hot rice topped with ghee or as a side dish for chapati or parathas. While buying pumpkin for preparing this chutney, choose pumpkin which is light yellow in color as shown in the picture.Try this easy and delicious chutney and enjoy the health benefits of pumpkin, which is low in calories and full of beta-carotene. Heat a tbsp of oil and saute pumpkin till soft. Keep aside. Heat 2 tsp of oil in the same pan, add mustard seeds, when they sputter, add hing, urad dal, red chillies, black pepper and curry leaves. Saute till dal turns golden brown. Grind it along with cooked pumpkin, salt and tamarind. Serve it with hot rice topped with ghee or with chapati. Pumpkin chutney looks delicious and tasty too.Great post. Chutney with pumpkin looks soo delicious and tempting.. The chutney looks very yummy and tasty! Slurp! Thatz a very new recipe to me:-) Looks very inviting..Bookmarked!! Pumpkin chutney awesome never tried this. sld try it once. Never had pumpkin chutney..sounds so tempting. pumpkin chutney is new to me !! looks so inviting and delicious !! Innovative and interesting recipe...I love it! Never tried making this chutney. Sounds interesting will try it soon. Never had chutney with Pumpkin,sounds and looks so tempting. Never heard of pumpkin chuney before..Looks delicious! Simple recipe..
Pumpkin chutney looks delicious. Amma used to make it. 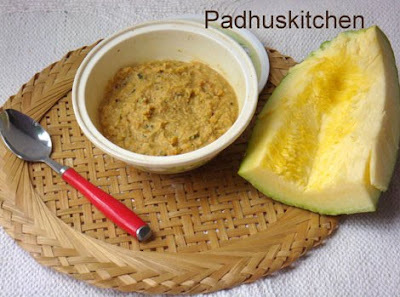 Wow Padhu, pumpkin chutney!!! never tried this before. Never tried this ...but looks delicious! love this thogayal - I make this kind with zucchini, chow-chow and bell peppers - So I know how delicious you thogayal must taste :) Now you've given me a new veggie to try - Thanks dear! Padhu this is uncooked chutney right? Can I make this with cooked pumpkin? Sounds new to me but looks so yummy..thanks for sharing! Chutney with pumpkin sounds yummy, shall try this soon, padhu..
Never tried this ...but looks delicious. Wow! Tried it. It was awesome.Thanks for such an innovative recipe.